CCBCi places a high emphasis on serving other people, both to be a witness to unbelievers of Christ’s love and to be an encouragement to our brothers and sisters in Christ. We serve those in our local Indianapolis community and in the international community through missions alongside believers. Horizon Christian Fellowship, our sponsoring church, is missions-minded. They have sent missionaries out to Kyrgyzstan, Ukraine, Hungary, Poland, Finland, Russia, and St. Kitts. We as a Bible college, in turn, have an amazing opportunity to serve internationally among these missionaries already involved in our church. 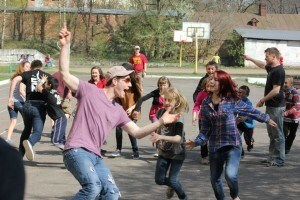 The mandatory yearly Practicum at CCBCi has taken our students everywhere; from playing and sharing the Gospel with kids in the orphanages of Ukraine, giving out food and blankets to homeless in Hawaii, doing street evangelism in Kyrgyzstan, to even coming alongside churches in Israel. The trips usually last 2-3 weeks, and almost a 1/3 of the funding for them comes straight out of the students’ tuition. The rest of the money is raised by the students through the year. Below is a map of some of our missions trips throughout the years. 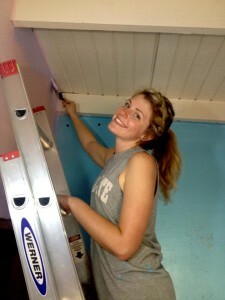 Students serve in various tasks on and off campus alongside fellow students and staff, applying the practical aspects of Christianity and servanthood as they learn to follow Christ. This may include serving in the various ministries of Horizon Christian Fellowship, our sponsoring church. This is one of the advantages of the CCBC Indianapolis campus – we are directly associated with a local church that allows our students to directly apply what they learn in class. Some of these service projects have included in the past: tutoring students at Pendleton Juvenile Detention Center, working in the Horizon Radio ministry, organizing and leading Bible studies at a nursing home, deep clean at Wheeler Mission’s Center for Women and Children, serving at Horizon Central (a sister church in downtown Indianapolis), and student-organized trips to clean up parks or do street-evangelism. Several times a semester every student will also serve CCBCi’s home church, Horizon Christian Fellowship, by serving meals. Every student is also responsible for serving their fellow classmates by sharing the duty of keeping the campus clean. Weekly service days are an enjoyable part of the Bible College experience and are often one of the most looked-forward-to parts of a student’s week!